It’s been a long hazy month for Washingtonians as wildfire smoke contaminated our air for the majority of August. At one point, Seattle even made national headlines for having worse air quality than Beijing, which is usually covered by a thick cloud of smog throughout most of the year. Smoke from both the Oregon and B.C. wildfires continues to circulate through the state, causing dangerous conditions for people with respiratory issues as well as pregnant women, elders, children and pets. Thousands of firefighters, covering a myriad of forest fires from all areas of the state, were called upon in an effort to control the flames during peak wildland fire season. Among the strike teams deployed across the state was the Northwest 3 Strike Team, comprised of firefighters from Bothell, East Jefferson, Skagit, Shoreline, Arlington and Tulalip Bay Fire Departments. 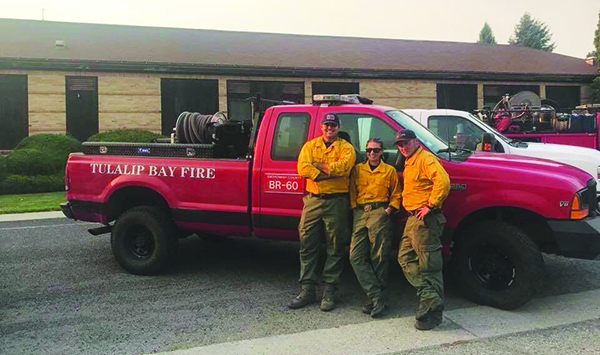 Tulalip Bay’s own Collin Chavez, Patrick Dineen, James Shockley, Lindsay Muller, Shawn Carlson and Jacob Shoresman were on the strike team and bravely fought three large fires in eastern Washington to protect nearby residents and businesses and help bring an end to all of the haze. The strike team was on duty for seventeen days, serving sixteen hours on the frontline and getting minimal sleep each night. The team setup camp at local schools, sometimes in tents on ball fields and other times inside the school’s gymnasium. The crew visited three sites to help suppress the fires at Silver Lake, Grand Coulee and Boyds (Kettle Falls). The reason for the fires is still under investigation but it’s safe to say that the extreme heat and dry air were among the factors. “The first fire was in Cheney, Washington at Silver Lake. We were the initial attack team. As initial attack you arrive and you’re the first ones to attack the fire for structure protection of homes and buildings in the vicinity of the fire,” says Chavez. “From Silver Lake we went to Grand Coulee. That was a grass valley fire, it started out very small in acreage around five hundred to one thousand and within two days it jumped all the way to 78,000 acres. It spread very quickly, there were some high winds. 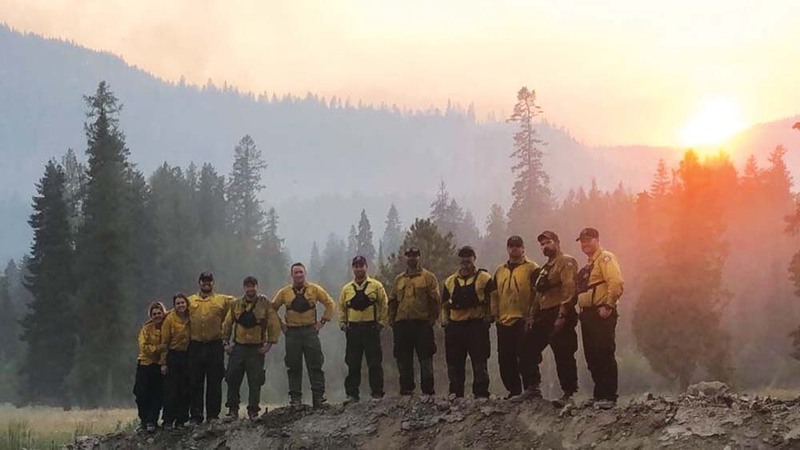 The strike team members returned to their respective departments now that nearly all three of the fires are under containment. The crew still remains cautious, however, ready to return to battle at any given moment. For more information, please contact the Tulalip Bay Fire Department at (360) 659-2416. 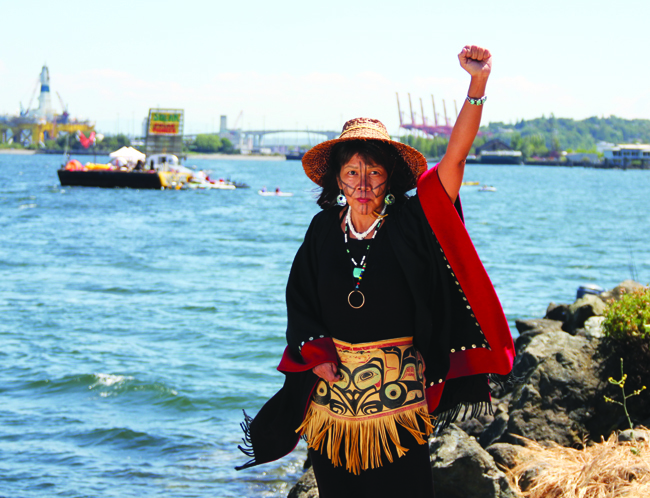 As members of the Tulalip Tribes, we hear the words “treaty rights” and “sovereignty” all the time. There is no doubt that to each of us they mean something different, yet there are some core principles that stem from these phrases. Sovereignty is the right to self-determination and self-governance. A sovereign government has the right to govern without outside interference from other groups. Our people were born sovereign as the first nations of this land. This is of course complex, and so are the tribes’ relationships with other governments. We know that we do not govern without interference from outside forces, especially the federal government. 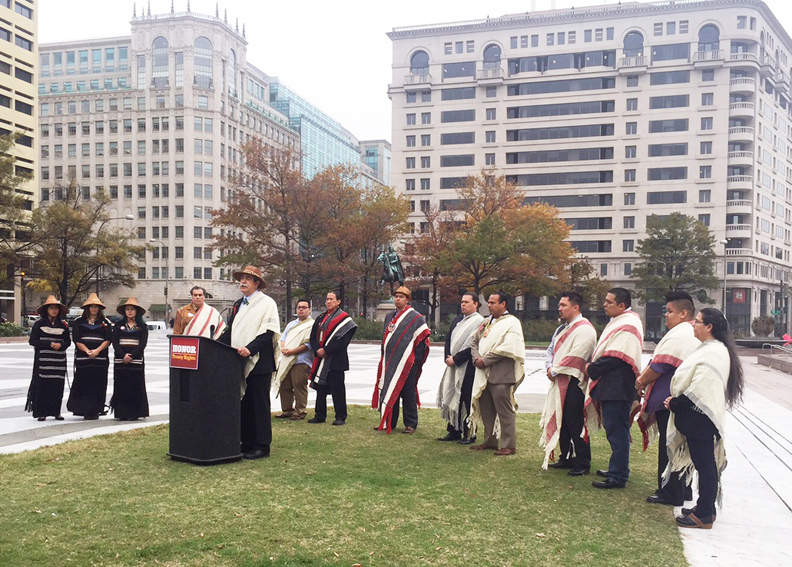 The federal government’s policy regarding tribal rights continues to change and has a significant impact on tribes throughout the country. We’ll discuss more issues around tribal sovereignty in a future article. The second important thing to define is a treaty. A treaty is a legally binding contract between two or more sovereign nations. It outlines the role each side will play in the future of the relationship and sometimes includes the reasons why they have entered into agreement with one another. Treaty rights are generally considered to be the rights reserved by tribes through treaty and are sometimes called “un-ceded rights” which reflects their existence prior to treaty signing. 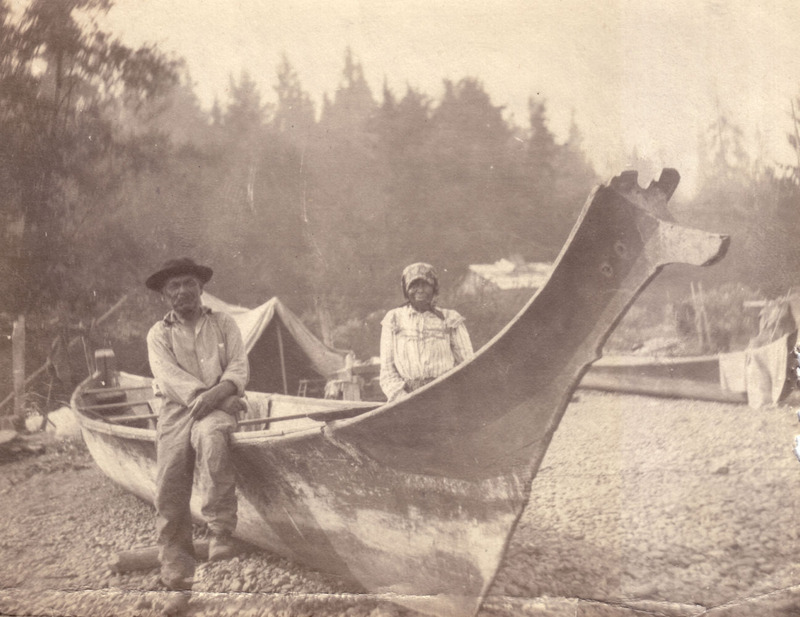 There were five treaties made with northwest Washington tribes; the Treaty of Point Elliott, the Treaty of Point-No-Point, the Treaty of Neah Bay, the Medicine Creek Treaty, and the Treaty with the Quinault. Compared generally to treaties signed with many tribes to the east of Washington they are much more favorable (that is not to say that tribes did not bear an unfair burden of sacrifice). Part of the reason for more favorable treaties is that the United States had a comparatively small standing army, just 15,911 enlisted men, which were tasked with covering a huge geographical area. They did not have the resources to fight wars with a number of tribes in a far off corner of the country. As a result, Governor Isaac Stevens was assigned to make peace and enter into treaties with northwest tribes in order to secure land for settlers in the Washington Territories. Congress itself defines treaties as the “supreme law of the land” and only signs treaties with other “nations” therefore recognizing tribes as nations and affirming that treaties supersede other laws such as those made by state governments. This excerpt also explains that the U.S. government understood that these rights were “natural rights” implying recognition of tribes’ existence as sovereigns before the creation of The United States. In the treaty, our ancestors made great sacrifices by ceding millions of acres of land for the promise of medical treatment, education, and permanent access to the resources they had always gathered, including across all of our ancestral lands that lie outside of the reservation. 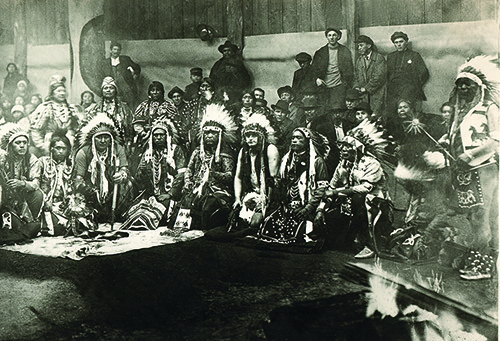 Though truthfully this article was never well defined in law until in 1974 when Judge George Boldt gave his decision in the landmark Indian law case US v Washington (commonly known as the Boldt Decision), where he affirmed what treaty tribes had already known: the phrase “in common with” was meant to be an equal sharing of the salmon runs minus the number of fish needed to spawn future generations.. This court decision, along with a series of subsequent decisions recognized tribes as having equal management authority with the State of Washington over natural resources. This has given tribes a significant role in how fisheries are managed as well as managing tribal hunting. Washington tribes have contributed greatly to the process of salmon recovery and restoration of critical habitats and species. Tulalip has also worked to conserve and enhance the plants and wildlife that our people need to continue to practice our traditional ways. Tribal and court interpretations of Article Five, secures tribal access to these resources until the end of time and recognizes that any entity whose actions diminish either these resources or our access to them violates the spirit and intent of the treaty. We know that the treaty is alive and well. It’s as important to us today is it was to our ancestors at the time of signing. We raise our hands to our ancestors and leaders past and present who fought and continue to fight to protect these rights and our way of life. Thank you for reading and we’ll see you next month! OLYMPIA—Today, Washington elected officials, business, fishing, tourism and conservation interests voiced their opposition to a Trump administration proposal that would open up 90 percent of the nation’s coastline—including Washington’s—to oil and gas drilling for the first time since 1984, despite decades of bipartisan coastal protection. The Department of Interior issued the 2019-2024 Draft Proposed Program on Jan. 4, for new offshore drilling activities in federal U.S. waters, 3 to 200 miles offshore. The proposed program would threaten Washington’s fishing, tourism and recreation economy, valued at hundreds of millions of dollars. The March 5 “People’s Hearing” was organized in the room adjacent to the Bureau of Ocean Energy Management’s public meeting, because the BOEM did not allow public testimony, only written comments. The National Outer Continental Shelf (OCS) Oil and Gas Leasing Program proposal has been met by fierce opposition by local, state, and federal leaders in almost every coastal state. In Washington, this includes Governor Jay Inslee, Attorney General Bob Ferguson, Public Lands Commissioner Hilary Franz, and members of the congressional delegation. There have not been any new leases in federal waters since 1984. Coastal business owners and citizens pointed to the long-term impacts from the oil spills of Exxon Valdez, Deepwater Horizon and the 1988 Nestucca spill at the mouth of Grays Harbor, on fisheries and businesses. The group urged a pivot to a clean energy economy that protects Washington’s coastal communities, and our valuable marine and other natural resources.NOAA data from 2015 states that they respond to 100 oil spills in U.S. waters every year. In December, however, the Trump administration announced it will roll back federal safety rules created following the Deepwater Horizon disaster. Ocean Shores was the first city in Washington to pass a resolution against the Trump proposal. In 2014, commercial (non-tribal) fisheries landed a total of 129 million pounds into Washington’s coastal ports with an ex-vessel value of $93 million. Annual recreational fishing on Washington’s coast averaged 47,000 trips on charter vessels and another 98,000 trips on private vessels between 2003 and 2014. In 2014, trip-related expenditures for coastal recreational fishing generated over $30 million in coastal spending, supported 325 jobs in coastal counties, and contributed $17 million in labor income. Shellfish aquaculture in Pacific and Grays Harbor counties provides an estimated 572 direct jobs, supports 847 total jobs, and generates $50 million in total labor income in the coastal region alone. Washington residents took an estimated 4.1 million trips to Washington’s Pacific Coast in 2014, with nearly 60 percent indicating their primary purpose was for recreation. These trips generated an estimated $481 million in expenditures. Recreational razor clamming generates between 275,000 and 460,000 digger trips each season and provides between $25 million and $40 million in tourist-related income to coastal communities in Washington. While the Bureau of Ocean Energy Management (BOEM) is not allowing public testimony at the meeting, it is accepting public comments on the Draft Proposed Program online during a 60-day comment period ending on March 9. Today’s meeting was the only public meeting to be held in Washington to gather additional input for this stage of the plan. After the comments are received and environmental reviews conducted, the Proposed Program will be released, triggering another comment period. The Final Proposed Program is expected by 2019. The current draft proposed plan includes one lease sale off Washington and Oregon. The livestream of the press conference can be viewed via Stand Up To Oil’s Facebook page: https://www.facebook.com/StandUpToOil/ (this link will be archived). The People’s Hearing, held in conjunction with the BOEM Open House, was organized by members of the Stand Up To Oil coalition, including the Surfrider Foundation, Washington Environmental Council, Sierra Club, Citizens for a Clean Harbor, and 350.org. 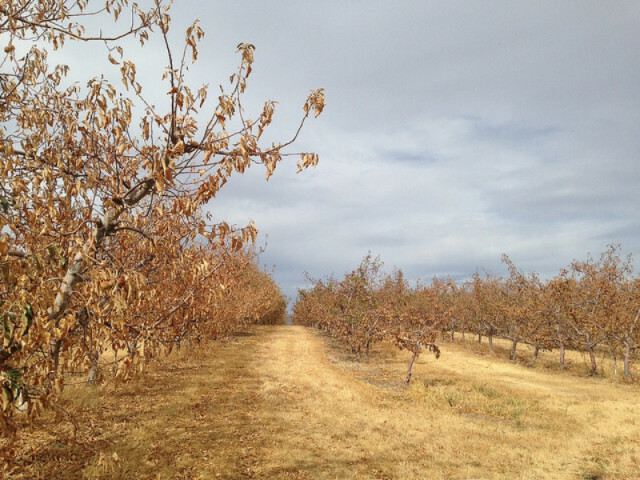 A lack of water has left apple trees in Benton County dry and brittle as severe drought conditions persist across 68 percent of Washington State. Don’t be fooled by the recent rain and cooler temperatures. Most of Oregon and Washington are still experiencing severe or extreme drought. With many of the region’s reservoirs and streams still far below normal and a warm winter on tap, experts are predicting this year’s drought will likely continue into next year. On a conference call Thursday, Washington Department of Ecology Director Maia Bellon said her agency is preparing for the worst: another year of drought that will take hold earlier and take an even bigger toll on the state. Projections for this year’s winter temperature and precipitation relative to normal conditions from 1981-2010. Washington State Climatologist Nick Bond said there’s a 10- to 15-percent chance this winter will be just as warm and devoid of snow as last winter. Oregon’s outlook is much the same, according to Kathie Dello, associate director of the Oregon Climate Research Institute. With so many low reservoirs and rivers, Dello said, even slightly below-average precipitation this winter would leave the region with a water deficit going into next year. Who wants to eat contaminated seafood? In many ways, Washington state is a shining example of a local and sustainable food system. Heirloom vegetables, heritage livestock breeds and sustainable seafood all find their way to farmers markets, local grocers and restaurant plates. Our citizens have a proud legacy of growing their own vegetables, raising their own chickens, catching their own fish and harvesting their own shellfish from local waters. It makes our state a great place to live, especially if you love food. We have a problem, however. Generations of manufacturing industries built up the economy of our state, especially the Puget Sound region, in a time before many pollutants were adequately regulated. These industries left a legacy of pollution. Despite significant improvements in recent years, unsafe pollution continues to this day, and we still have a long way to go. Long-lasting toxics, including PCBs, arsenic, mercury and many others, persist for years and find their way into our fish and shellfish. As longtime restaurateurs, sports anglers, sustainable food advocates and concerned parents here in the Pacific Northwest, we understand exactly how much people in this region value local fish and shellfish. Whether on the Washington coast, in the Puget Sound region, Hood Canal or Columbia River Basin, fishing, crabbing, clamming and harvesting oysters are ways of life and part of the heritage that makes life in Washington so rich and special. It is also one of the reasons why we are so concerned with the quality of our state’s streams, rivers and other water bodies. The state Department of Ecology has an opportunity right now to better protect those resources and the health of everyone in Washington who eats local fish and shellfish. Last year, the department proposed a long-overdue update to Washington’s water-quality standards. The current rule is inadequate and out of date, lagging behind our neighbors in Oregon, despite our strong fishing economy and culture. But the Department of Ecology’s current proposal would fail to sufficiently improve protections because of loopholes that would allow “acceptable” levels of many toxic chemicals in our waters, including PCBs, mercury and arsenic, to remain exactly the same. The new rule would address the unreasonably low daily fish-consumption rate, increasing it to 175 grams from 6.5 grams. 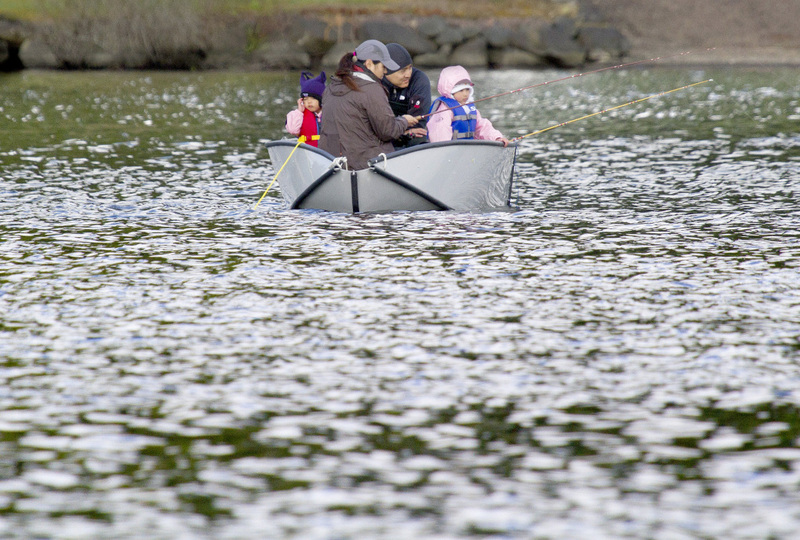 The increased consumption rate better would reflect how much fish Washington residents eat. However, the proposed rule would also include a 10-fold increase in the allowable cancer-risk rate. This second change would effectively negate most, if not all, of the important protections that these regulations are meant to provide. The Clean Water Act requires that states maintain “water quality criteria sufficient to protect the most sensitive of the uses.” Consumption of seafood is one of the most sensitive uses. Many Washington residents, especially tribal members, Pacific Islanders, commercial and recreational fishermen, eat large amounts of fish and seafood from these waters. Our children eat seafood, and are much more sensitive to pollutants. The Department of Ecology’s own research shows that at least 29,000 Washington children eat more than 190 grams of fish — about one fillet — every day. It’s time for our state officials to fix our water-quality standards. We want to know that when we harvest salmon or Dungeness crab from the Sound, collect oysters on Hood Canal or catch sturgeon on the Columbia River, that these are safe to feed to our friends and family. The state has the authority and responsibility to regulate pollution and clean up our waters. The question is: will it? Kevin Davis is the co-owner and executive chef at Steelhead Diner and Blueacre Seafood. Julie Kramis Hearne is a cookbook author and former restaurant owner living on Hood Canal. Hamilton Seymour, 15, of Bellingham, Wash., introduced first lady Michelle Obama at the first White House Tribal Youth Gathering in Washington, D.C., on July 9, 2015. 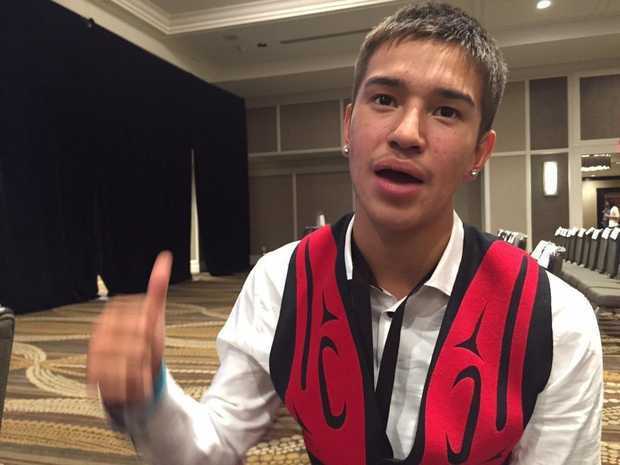 WASHINGTON — After losing his father to suicide in 2012, teenager Hamilton Seymour said he wanted to find something positive in his life: He found healing by paddling his canoe. Convinced that exercise is “a stress reliever” and the key to improving mental health, Seymour now is pushing other members of his tribe to deal with grief and celebrate their culture by carving canoes and singing traditional Native songs as they paddle their way to fitness. His efforts are gaining attention. After Seymour won a national award earlier this year from the Center for Native American Youth, he found the spotlight on Thursday at the first White House Tribal Youth Gathering, when he was picked to introduce first lady Michelle Obama before her speech to the group. “It was just surreal,” said Seymour. An official in the first lady’s office said Seymour was chosen because his story served as a “source of inspiration” for other Indian youths. But Seymour speculated that there was another reason. Seymour was one of five Indian youths from across the nation cited as a 2015 “champion for change” by the Center for Native American Youth, an award that recognizes youths who are making a difference in their communities. Center officials noted that while most adults are uncomfortable talking about such issues as sexual abuse and suicide, Indian youth leaders are tackling the issues head on. Seymour, whose parents divorced when he was 6 years old, said he didn’t want to discuss specifics of his father’s suicide. But he said the act of violence leaves survivors suffering. Growing up, he said, he has learned that “you only get out of this world what you put in,” but he said he doesn’t want to judge others who struggle. He said many Indian kids are growing up in homes where parents are fighting and the children aren’t getting enough sleep or food. Seymour said his application for the award focused on keeping culture alive through traditional sports. As part of his project, he has lined up 11 other teens to help him paddle canoes in races. Seymour said paddling comes naturally to him, with the tradition strong on both sides of his family. He said his father, a Canadian Indian who was in his early 30s when he committed suicide, was a champion paddler. “He was a phenomenal man, and I’d like to carry out his name and his spirit through paddling. . . . I feel like paddling is only one of the few things that I have left of him,” Seymour said. Some of Seymour’s friends from Bellingham, who are also in the nation’s capital this week as part of various tribal youth events, said Seymour has come a long way. William Lucero, 18, another member of the Lummi Nation, said it was remarkable to watch Seymour get a hug from the first lady. Seymour, who will be a junior at Mount Baker High School in Deming, Wash., this fall, said it was a “once-in-a-lifetime experience” to share the stage with Michelle Obama. “I didn’t know she was that tall,” he said. When an announcer called his name, saying it was time to introduce the first lady of the United States, Seymour said he temporarily lost his breath. Seymour figures his life is looking pretty bright, too. “I can’t tell the future, but I’m really hoping, and I really feel like it’s going to be great,” he said. Washington state is under a federal court order to fix hundreds of barriers built under state roads and highways that block access for migrating salmon and thus interfere with Washington tribes’ treaty-backed right to catch fish. But it’s not clear how the state is going to come up with the estimated $2.4 billion it will take to correct more than 825 culverts — concrete pipes or steel structures that allow streams to flow under state roads and highways. The state says it would need to fix an average 30 to 40 culverts a year by 2030, spending $310 million every biennium, to comply with the 2013 court injunction. The state has appealed the judge’s decision. But in the meantime, the Legislature last week approved millions to correct fish barriers statewide. The 16-year transportation revenue bill includes $300 million for fish passage, dramatically more than in the past but far short of what the state estimates it needs. The House still needs to pass two Senate-approved bills to complete the transportation package. Lawmakers have referred to this case as the other McCleary decision, which told the state to fix the way it pays for public schools. “Ultimately it’s something we’re going to have to address; it’s just a question of timeline for when we’re going to get done,” Orcutt said. The injunction issued by federal Judge Ricardo Martinez stems from the landmark 1974 Boldt decision, which affirmed the treaty rights of Northwest tribes to catch fish. 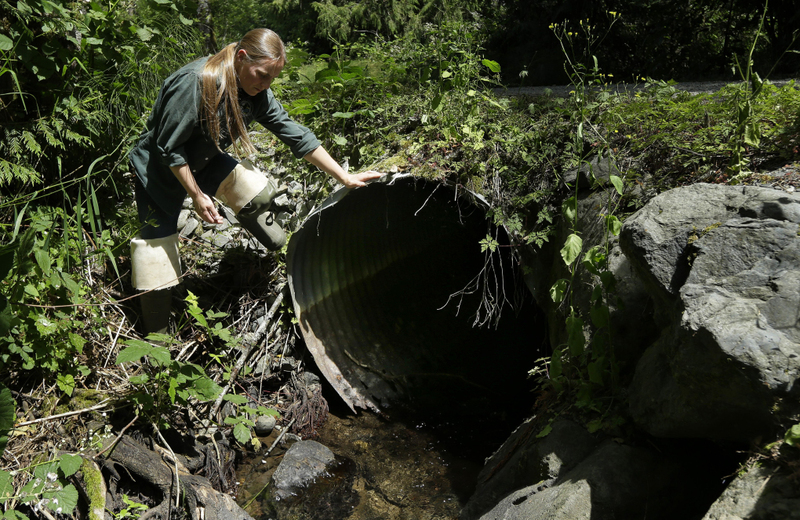 The judge said fish-blocking culverts contribute to diminished fish runs. “It is a treaty right. Tribes ceded the entire state of Washington to the federal government. In return, we asked that we have salmon forever,” said Brian Cladoosby, chairman of the Swinomish Indian Tribal Community. He said he was disappointed with the state’s appeal and questioned how much money the state had spent in appealing the case that could have gone toward fixing the problem. The state Department of Transportation, which is responsible for correcting the largest number of culverts under the court order, has been working on fish passage for a number of decades, said Paul Wagner, the agency’s biology branch manager. This year, the agency plans 13 fish-passage projects across the state. It also completed 13 such projects in each of the past two years. But Wagner acknowledged that significantly more money will be needed to meet the terms of the injunction. Culverts can be a problem for fish in several ways. Stream flows running through a small pipe can be too fast, making it harder for fish to swim upstream to spawn or downstream to reach the ocean. Perched culverts also can be too elevated for fish to jump through. “It’s a big, big problem,” said Julie Henning, state Department of Fish and Wildlife habitat division manager. When culverts are removed or fixed, the benefits are immediate because it opens up miles of critical habitat upstream to fish, said Henning, who also co-chairs the state’s Fish Barrier Removal Board. That board, created by the Legislature last year, is working to coordinate with counties, private landowners, tribes, state agencies and others to get the most benefit out of projects to remove fish barriers and recover salmon runs. “When you think about a fish swimming upstream, it goes through all these jurisdictions,” Henning said. Counties, cities, forest owners and others have worked independently to remove fish barriers only to find that culverts elsewhere on the stream continue to block fish passage. On the North Fork of Newaukum Creek near Enumclaw one afternoon, Henning and Department of Fish and Wildlife fish biologist Melissa Erkel pointed out a project King County did several years ago to replace two aging pipes with a large box culvert that is wide enough to allow the stream to meander. But less than a quarter-mile upstream, two culverts block access for fish. Erkel said she has provided technical assistance to the private landowner, who plans this fall to replace them with a 35-foot span bridge to allow more water to pass under the private road. “Fish passage is really important work. We’re not just doing it because of the lawsuit. It’s something that needs to be done,” Henning said.